Rather than repine about the worst Cell paper I've ever read*, let's cover a new Cell paper from David Anderson's lab. In my past posts on taste, I've covered a lot of the Zuker lab's work on mammalian taste receptors, and other labs' work on how neuromodulators can effect taste receptors. Parallel with the work on mammalian receptors, many taste receptors have been identified in the fly, including non-canonical receptors for water and carbonation. However, I am not aware of any papers that have investigated how neuromodulators effect feeding behaviour or taste perception in flies. In today's paper, Inagaki and colleagues used a new-ish fluorogenetic (sic?) probe, and typical fly genetic manipulations to show that dopamine can regulate sweet sensitivity in central circuits. The Anderson lab's primary focus is neuromodulation, and not chemosensation. Indeed, the first line of the abstract emphasizes this, "Behavior cannot be predicted from a 'connectome' because the brain contains a chemical 'map' of neuromodulation superimposed upon its synaptic connectivity map." (Curiously, "connectome" does not appear again in the paper.) In this paper, they focused on the neuromodulator dopamine (DA), which they measured using a genetic reporter called Tango (see below). In the Tango system, you take a receptor of choice (here the dopamine receptor DopR1), and attach it to a bacterial transcription factor (lexA) by way of a cleavage site (TEV). When the receptor gets activated, it recruits arrestin fused to a protease (TEV protease), which releases the transcription factor, which in turn drives a reporter (GFP). DopR-Tango reporter system. A. Diagram of construct used to express Tango system. 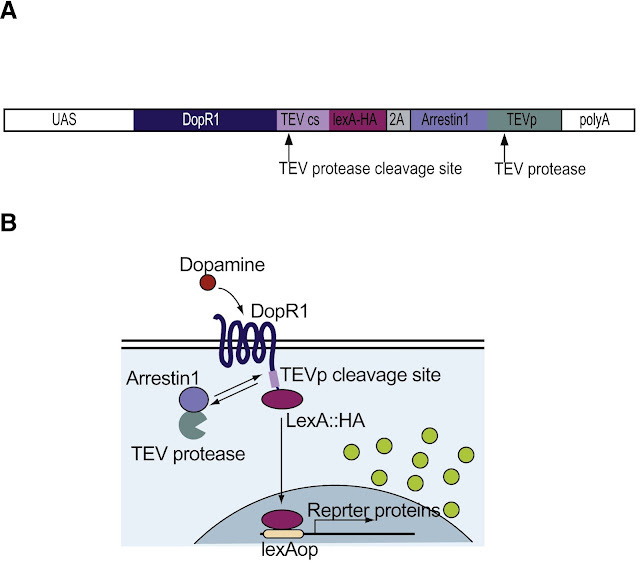 The DopR1 protein is fused with a TEV cleavage site and lexA transcription factor. The vector uses a 2A site to also express TEV protease fused to arrestin. B. How dopamine binding drives expression. Dopamine binding recruits arrestin1, which brings with it TEV protease. The TEV protease cuts the cleavage site, releasing LexA, which presumably translocates to the nucleus, inducing reporter expression. They first tested their DopR-Tango system in HEK cells, where it was able to report DA with an EC-50 of 1uM, and did not respond to 5-HT or octopamine. They then tested Tango in flies and found they could measure endogenous expression of the reporter. To verify that DopR-Tango could detect changes in DA levels in vivo, they fed the flies L-Dopa, a DA precursor, and found increased GFP expression in the subosephageal ganglion (SOG; associated with feeding), the antennal lobe, and the mushroom body (both associated with olfaction). The increase by L-Dopa could be prevented by feeding the flies DA synthesis inhibitors. Having established that the DopR-Tango system works in vivo, and noticing that DA is expressed in feeding centers, they next investigated how satiety influences dopamine expression. They wet-starved (viz. water, no food) the flies for 6-24 hours, and measured the dopamine expression throughout the brain. They found that wet-starvation increased DA levels in the SOG, but not the olfactory centers (see below). Once again, this DA increase could be reversed by dopamine synthesis inhibitors. Hunger increases dopamine levels in feeding areas of the brain. C1. Flies expressing DopR-Tango were wet-starved for 48h. 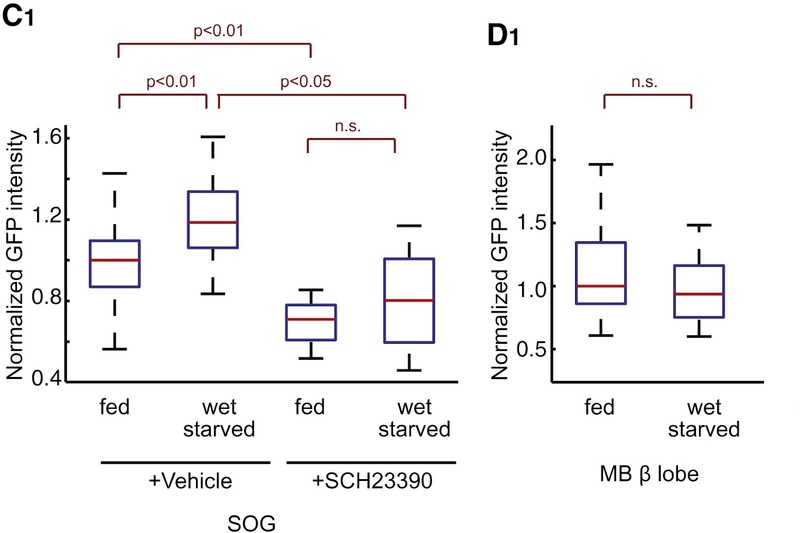 Following wet-starvation, GFP intensity in the SOG increased, and this could be blocked by dopamine synthesis inhibitors (SCH...). D1. Dopamine levels in olfactory centers in the fly were not effected by wet-starvation. Having established that DA and starvation are correlated, they next investigated how DA and starvation could modulate feeding behaviour. (I'm actually curious as to the chronological order of these experiments. It's not obvious to me that the next step here should be behaviour.) To assay behaviour, they measured flies' proboscis extension reflex (PER), a behaviour wherein flies extend their proboscis when presented with sugar. Sated flies only extend their proboscis when exposed to high concentration sucrose, while starved flies extend their proboscis at lower concentrations (below, left). When they fed L-Dopa to the flies, they found a similar phenotype: the flies extended their proboscis at lower concentrations (below, right). A. Starved flies extend their proboscis at lower sugar concentrations. B. Similarly, flies fed L-dopa extend their proboscises at lower concentration. By performing a lot of qPCR (and other molecular techniques that all got shoved in a supplemental figure), they found that the SOG expresses three types of dopamine receptor: DopR1, D2, and DopEcR. Then by utilizing various knockout and RNAi techniques, they found that flies with DopEcR missing did not extend their proboscis at lower concentrations, showing it was the receptor responsible for the signaling (below, right). Furthermore, by specifically knocking it out in Gr5a-expressing neurons (Gr5a is the fly sugar receptor), they identified the gustatory receptor neurons as the site of modulation. DopEcR is the DA receptor responsible for the increase in PER. A2. To knock out DopEcR function, they used flies expressing a hypomorphic mutation, DopEcRc02142 throughout the fly. These mutant flies, when fed L-dopa, did not show PER at low sucrose concentrations. Having established the site of modulation, one might think that DA simply increases the firing of the receptor neurons, increasing sugar sensitivity. However, when they recorded extracellularly from these neurons, they found that the firing rate was uneffected starvation (again shoved into the supplemental figures). The next possibility they looked at was synaptic release, which they measured via confocal calcium imaging on the terminals of Gr5a neurons. Here they found that both wet-starvation and L-dopa treatment increasing the calcium in the terminals (to vary degrees of statistical significance; for some reason they used the Bonferroni correction). 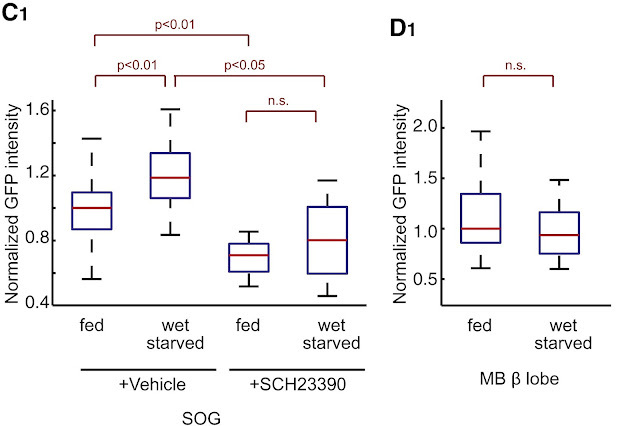 Dopamine and wet-starvation increase calcium release from Gr5a terminals. C. They performed calcium imaging on Gr5a terminals while applying increasing concentrations of sucrose. At high sucrose concentrations, wet-starved or L-dopa fed neurons had higher calcium. D. Quantification of C.
In summary, they 1. refined a fluorogenetic probe for neuromodulator activity in flies; 2. found that dopamine expression increases following starvation; 3. that the dopamine increases sugar sensitivity; and 4. that its site of action is Gr5a nerve terminals. This is the first paper I'm aware of that has investigated how neuromodulators effect taste in flies. In mammals, numerous neuromodulators - including leptin, endocannabinoids, and oxytocin - act in taste buds; and centrally, leptin and cannabinoids have multiple sites of action in the lateral hypothalamus and other nuclei. None of this mammalian research, however, was mentioned in Inagaki's discussion. I'm not sure whether this is due to the divide between mammalian and fly research, that the Anderson lab is not familiar with taste literature, or they simply thought it was not relevant. In any case, the discussion focused on neuromodulation in the fly, which I'm not informed enough to comment on. It will be interesting to see if this reporter can be adapted to other receptors or animal models. On the whole, though, this paper is reporting something completely new, so there is little room to compare to other findings. * Ok, I will complain. Without naming names, this paper had behavioural experiments without any statistics (literally none in the entire paper); and used ChR2 in a conditioning paradigm, which has been done repeatedly, without really caring about the neurons infected. Let's just say that lab is no longer on a roll.